In this post we will set up a virtual lab for malware analysis. We’ll create an isolated virtual network separated from the host OS and from the Internet, in which we’ll setup two victim virtual machines (Ubuntu and Windows 7) as well as an analysis server to mimic common Internet services like HTTP or DNS. Then, we’ll be able to log and analyze the network communications of any Linux or Windows malware, which will unknowingly connect to our server instead of the Internet. We demonstrate the setup with a real life use case where we analyze the traffic of the infamous TeslaCrypt ransomware, a now defunct ransomware which infected a large number of systems from 2015 to mid-2016. Diagram of our future setup. Note that the machines in the virtual network will be isolated from the host OS and will not be able to connect to the Internet. This guide includes quite a lot of material, so here’s a table of contents to give you an overview of what we’ll cover and let you jump directly to a section if you’d like. Here are two links you can use to download Ubuntu and Windows 7 virtual machine images. 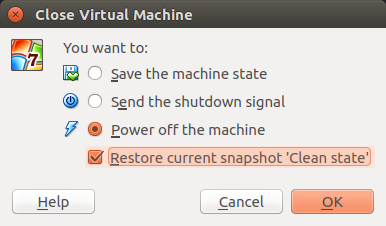 Tip: if you already have an Ubuntu virtual machine you’re not using, you can simply clone it and reuse it in the next steps (right click > Clone). Before starting, make sure you have enough disk space available (I’d recommend at least 10-20 GB). OsBoxes provides us with a ready-to-go virtual disk that we can simply plug on a VM and start using right away. Start by extracting the archive you just downloaded. You’ll be provided with a VDI file representing the virtual disk of the machine. We’ll start by setting up the base Ubuntu image, which we will then clone to have our two Ubuntu VMs. In VirtualBox, create a new machine (New button), and call it Ubuntu analysis. Then, select how much RAM you want to give it. At this point, VirtualBox will ask you if you wish to create a new virtual hard disk or use an already exiting one. Select Use an existing virtual hard disk file, click on the directory icon at the right of the dropdown list, and select the VDI file. You can then power up the machine. The default password is osboxes.org. The default keyboard uses the QWERTY layout. If like me you’re not familiar with it, start by changing it (Settings > Text Entry). It can also be a good idea to update your packages. Select Devices > Insert guest additions CD image in the menu of the window in which the VM runs. You will then be asked if you want to run the installer; answer yes, and enter the default password (by default osboxes.org). Once the installation is complete, power off the VM. 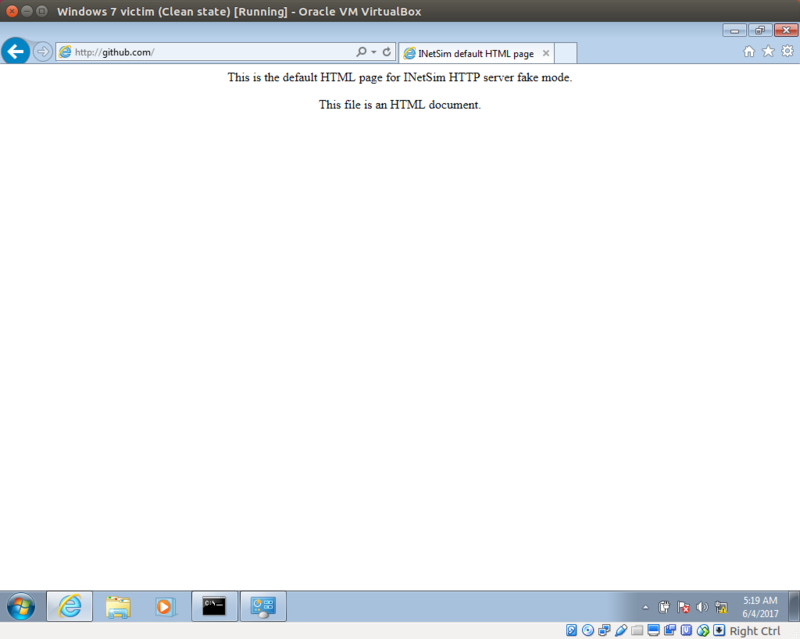 Now that you have a basic Ubuntu VM ready to go, clone it (right click on it in the main VirtualBox interface > Clone). Name the clone Ubuntu victim, and check the checkbox to reinitialize its MAC address. Select Full clone for the type of clone. The download link I provided earlier points to a ZIP archive containing a OVA file. Unlike a VDI file it’s not only a virtual disk, but a full description of the virtual machine (including its virtual disk), so the only thing you need to do to create a virtual machine from it is to select File > Import Appliance in the main window of VirtualBox. If you can afford it, it’s probably better to give it at least 1024 MB of RAM. Once the import process is complete (it can take a few minutes), rename the VM Windows 7 victim and power it on. Select Devices > Insert guest additions CD image in the menu of the window in which the VM runs, and run the installer from the virtual CD which has been inserted. When you’re done, power off the machine. INetSim is a very handy and powerful utility that allows to simulate a bunch of standard Internet services on a machine. 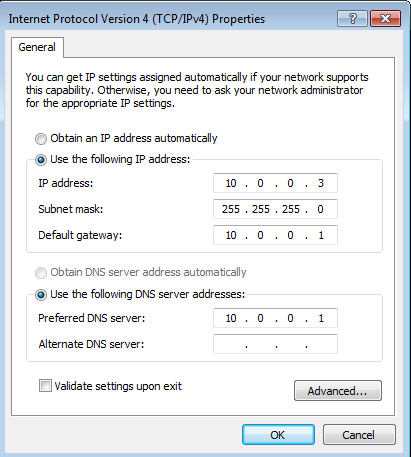 By default, it will among others emulate a DNS, HTTP and SMTP that you can easily tune. Since we’ll later configure our victim machines to have no Internet access, we will need INetSim to simulate it. There are several ways to install INetSim. The easiest is to run the following commands (in the analysis machine). Note: in order to be able to copy-paste those commands in your analysis machine, select Devices > Shared Clipboard > Bidirectional. We’ll come back later on how to use INetSim. Unfortunately, it seems that INetSim’s SSL support is quite limited: it comes with a certificate for a single host (inetsim.org) and doesn’t support generating SSL certificates on the fly. This is a problem since most malwares nowadays encrypt their communications with SSL. We’ll use Burp as a transparent SSL proxy, which will stand in the middle of the victim machines and INetSim for SSL connections. 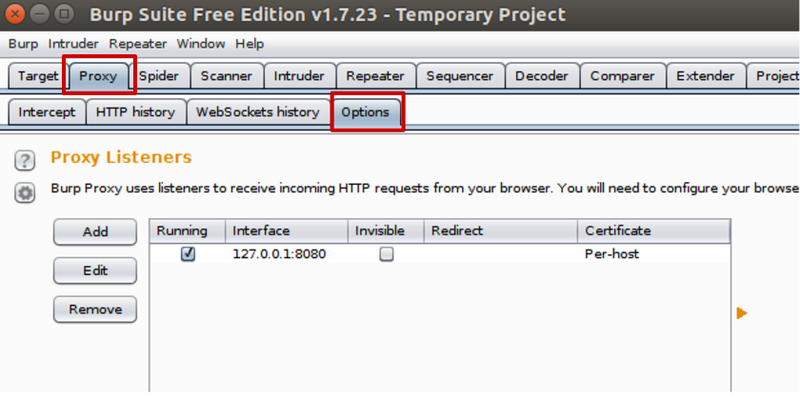 If you don’t need to intercept SSL traffic for now, you won’t necessarily need Burp. Burp supports generating on-the-fly SSL certificates for any our victim machines will connect to. It also creates a single root CA certificate, that we’ll later import in our victim machines. This way, we’ll be able to intercept the encrypted communications that our malware sends. By default, the Burp executable will be ~/BurpSuiteFree/BurpSuiteFree. As a reminder, we want to set up an isolated network containing our three VMs. This network will not be able to access the Internet. Also, we want the analysis machine to act as a network gateway to the victim machines in order to easily be able to intercept the network traffic and to simulate various services such as DNS or HTTP. In order to achieve this, we will use a VirtualBox Internal Network. For those familiar with VirtualBox, an internal network differs from a host-only network in that an internal network cannot access the host machine at all. Power on the analysis machine, open a terminal, and run the ifconfig command. You should have an interface named enp0s3. If the name differs, just adapt it in the instructions to follow. Right-click on the network icon in the taskbar (or go to Start Menu > Control Panel > Network and Internet > Network and Sharing center), click on Local Area Connection 2 > Properties, select on Internet Protocol Version 4, and click on the Properties button. We’ll assign the static IP 10.0.0.3 to the machine, and configure the rest similarly to the Ubuntu victim machine. Now that our victim VMs are properly configured and are in a clean state (i.e. not infected by any kind of malware), we are going to make a snapshot of their current state. This way, we will be able to easily reset them to this clean state at any point time. 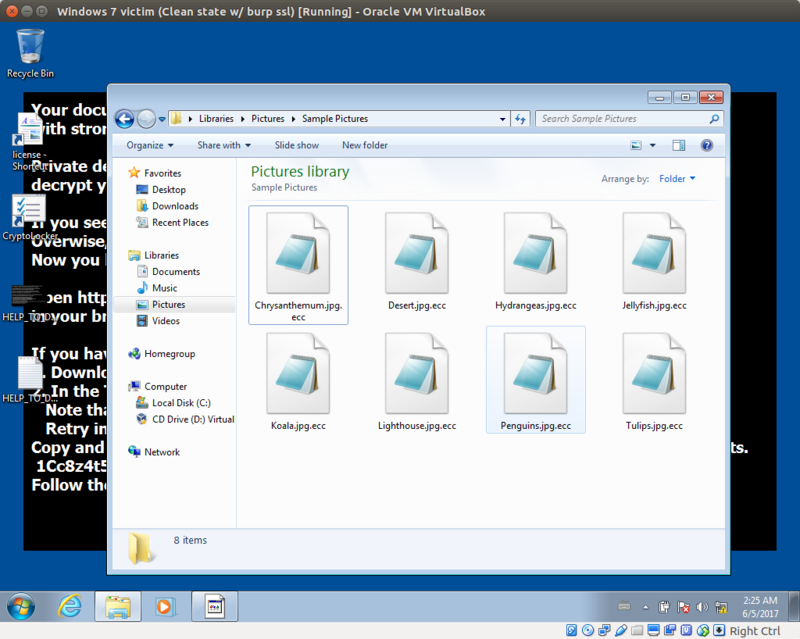 VirtualBox makes this very easy: in the window in which the VM is running, just select Machine > Take Snapshot. You can name the snapshot Clean state. Make sure to do this for both your Ubuntu and Windows 7 victim machines. It doesn’t hurt to do it for your analysis machine as well. When you’ll want to reset a machine to its clean state, simply power it off and check the checkbox Restore current snapshot ‘Clean state’. As previously mentioned, INetSim enables us to wide range of standard Internet services including DNS, HTTP(S), SMTP, etc. It has a default configuration file /etc/inetsim/inetsim.conf which is very well documented. It also ships with a data directory (/var/lib/inetsim) containing various default files. Since you’ll probably want a different INetSim configuration each time you make a new analysis, I suggest you create a directory analysis which will contain a sub directory for each analysis. We’ll already create a sub directory for the sake of example, and copy the default INetSim configuration file and data folder in it. Now, we need to disable systemd-resolved, which is a local DNS server shipped by default with Ubuntu and will conflict with INetSim’s DNS server. As you can see, INetSim has launched a bunch of network services. Those are all configurable and can be disabled in the configuration file. This configuration file is very well documented and explains all the options of INetSim; I recommend you take a few minutes to read it. Back on the analysis machine, shut down INetSim (CTRL + C). As you can see, INetSim has created a summary report for us. It contains all the interactions our victim machine had with INetSim services. To be able to analyze the SSL traffic, we also need to run Burp. We’ll run it as a transparent proxy in front of INetSim. When a victim machine will initiate a SSL connection, it will first go to Burp, which will then proxy it to INetSim. This section is not mandatory: if you don’t need to intercept SSL traffic right now, just jump to the next section. Create a temporary project (you don’t have any other options with the free version anyway), and go to the Proxy tab, then to the Options sub-tab. You’ll see Burp’s default listener listening on port 8080. By default, Burp intercepts the incoming requests and waits for you to explicitly let them pass through. To avoid this, go to the Intercept tab and click the button Intercept is on to disable it. Since Burp Free doesn’t allow you to save a project, you can export the settings we just made in order to import them next time you start Burp. To do this, use Burp > Project options > Save project options. This is because Burp generates a SSL certificate signed by its own CA certificate, which our victim machine doesn’t trust for now. Then, from the victim machine, browse to http://10.0.0.1:8080. Click on CA Certificate in the top-right corner to download Burp’s CA certificate. Once you imported Burp’s CA certificate in the victim machines, make sure to create a new snapshot (e.g. Clean state with Burp’s CA certificate installed). At some point, you’ll obviously want to transfer some files to the analysis machine or to one of the victim machine; we’ll set up a file share to achieve it. In the VirtualBox running the analysis machine, go to Devices > Shared Folders > Shared folders settings. Create a new shared folder, choose the local folder of your host OS it should be mapped to, and choose a name. Check the checkbox to make it permanent. And you’re good to go. In my case, all the files of my host machine located in /home/christophetd/malware-analysis-share will also end up in ~/malware-analysis-share in the analysis machine. At some point, you’ll most probably need to transfer some files (e.g. malware samples) to one of the victim machines. Setting up a file share for them is a bad idea, because it means the victim machine (and by extent, the malware sample you’re running on it) have access to it. The simplest way to achieve a file transfer to the Ubuntu victim machine is to use netcat. Here’s a quick example. For a Window victim, we unfortunately don’t have netcat available. Alternatives might exist, but they probably don’t ship by default. One option is to use INetSim to serve your file to the victim machine. With this of configuration, just browse any URL ending with a ‘.exe’ (e.g. http://github.com/file.exe). Time for a quick demo! I downloaded a sample of the ransomware TeslaCrypt, transferred it to our Windows 7 victim machine, and executed it. After a few seconds, all the files of the VM have been encrypted and the following window pops-up. And sent several HTTP requests to those domains. We see similar requests are made to tor2web.org, tor2web.blutmagie.de and tor2web.fi. Those services allow to access the Tor network without having to install Tor Browser or a similar tool. It also makes an API call to bitcoin.toshio.io (which doesn’t exist anymore), most probably to check if the ransom has been paid to the bitcoin address 1LNUF3BqL3ob1CT2aVp3cW4Nb8zkkViVwT. It seems like the malware generates an unique bitcoin address for each infected computer, since the address didn’t receive or send out any money. Hopefully this guide will be helpful and allow you to safely analyze the network interactions of a malware. Keep in mind that some malwares detect when they are being run in a virtual machine and might adapt their behavior (e.g. do nothing). Here’s an article from MalwareBytes on the subject. Also, remember that while analyzing a malware’s network traffic can be very useful, it’s only one kind of dynamic analysis. Others include monitoring the register, the system calls, the files opened / created, etc. Open Security Training offers a full hands-on course on the topic, for free. Don’t hesitate to leave a comment if you found this guide useful / awesome / too long / too detailed. A big thank you to lbarman for the proofreading and numerous suggestions. Liked this post? Show it by pushing the heart button below! You can also follow me on Twitter. Awesome! You prefer to use Burp instead of Fiddler? Thanks! Just more familiar with Burp, but I guess Fiddler could do the trick as well. I’m not familiar with how WannaCry communicated with the kill-switch, but I’d say that yes, it would have detected that the malware was trying to access it. Great tutorial, thank you! Where did you get your teslacrypt sample from? Cannot download TeslaCrypt from The Zoo. I loved your post. somehow I cannot not infect my windows. I downloaded teslacrypt binary and copied the zip to the win7-victim. but I cannot infect the system, do I need to extract the zip (then there are 3 files with hex names) or should I just run it as exe? am I missing something? As far as I remember I just had to rename the file with a .exe extension, run it, and wait a few minutes. I think “sudo service systemd-resolved.service stop” should be “sudo service systemd-resolved stop” (at least that is what worked for me). Great write up btw, really enjoyed it. Thanks for the write up, very well done. A quick question out of curiosity since I’ve only been exposed to a QWERTY set up are you unfamiliar with this because your keyboard is in another language or do you have a preference for a different keyboard layout? Glad you liked the write up! I’m not familiar with QWERTY simply because I’m used to other layouts (AZERTY, QWERTZ). It’d be great to hear your thoughts on this. If I understood correctly, you’re talking about malicious URLs with multiple redirections, e.g. malicious1.com -> malicious2.com -> malicious3.com/file.exe ? I don’t think this can easily be analyzed with INetSim. I’d recommend manually following the redirections (e.g. using curl) to get to the final file and, once you have it, use INetSim to return the file to the malware. Where can I download a sample for TeslaCrypt version 2? Indeed, it doesn’t really matter if a malware tampers with your virtual machine, as you can restore it to a previous state (without even needing to recreate it) within a matter of minutes. You’re also right regarding the other point: if a malware was to exploit a VMWare / VirtualBox vulnerability enabling him to escape the virtual machine, it could theoretically access your host computer. However, I’d say those vulnerabilities are very rare. If your threat model includes protecting against those vulnerabilities, the best would be to use a dedicated machine (e.g. 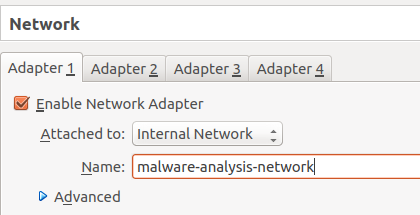 separate laptop), not connected to the Internet or your local network, to do malware analysis on. I just recommend choosing a recent Ubuntu distribution, as 16.10 is not available. Very nice article and thank you very much for sharing. Is the Ubuntu 16.10 a must or I could choose another since it’s not available anymore on the link you provided. 17.10 is available but I’m leaning on using 16.04. Hey @christophertd, I really enjoyed your article. I’ve used it as a main jumping point from an enterprise course I did regarding reversing malware that used VMWare Workstation. I used `ovftool` to seamlessly convert the images to .ovf format for VirtualBox and it worked just fine (there were some quirks here and there but nothing Uncle Google couldn’t handle!). A couple of quick startup tips: I use REMnux from SANS’s Lenny Zeltser as the Linux analysis machine. It is fantastic and comes packed with a lot of cool toys and scripts. Also, I use FakeDNS.py to simulate a fake DNS server instead of doing the manual work as you mentioned. As for the Windows Victim machine, I’m using my own but I heard great things about FlareVM from FireEye. I’m including links to all the above below. Thanks again and I hope you keep this post alive!! It is very good content. Thank you!! However I cannot install Inetsim on my Analysis machine. it says “no valid OpenPGP data found” on the second step of the installatio and “E: Enable to locate package inetsim” on the last step. I tried the installation again on an Ubuntu 17.10 machine, and it is working fine for me. Can you double check you ran the right commands, and if that’s the case provide more details (such as your Ubuntu version)? Thank you! I copied out the commands from the article and it did not work. I used Ubuntu version 16.4.05 (64bits). I’ll give it a go with 17.10 now as you suggested. I was behind corporate proxy using our company certificate. I’ll give it a go at home and put another commentary here. Yes it’s been the proxy.